Should there be a law against showing your underwear in public? Maybe not this year. A Statehouse bill that would create a system of minor fines for any male that exposes his underwear or shows skin below the waist is being abandoned by lawmakers less than a week after being introduced. The move comes after angry voters said enacting such law now is bad timing when there are bigger problems facing the state. State Rep. Wendell Gilliard, D-Charleston, one of the early backers, said his constituents told him the Statehouse's attention is better suited on guns in schools, crime and increasing teacher pay, to name a few. Gailliard said he listened to the public "and they are right." The mood apparently is widespread. Eleven House members signed on to the bill when it was introduced Thursday. By Wednesday, six ordered their names be stricken. Since The Post and Courier first wrote about the bill last week, the story has been picked up by media outlets across the state and also nationally. The law creates a minimum $25 fine for exposing your underwear — or other lower body areas — in public. 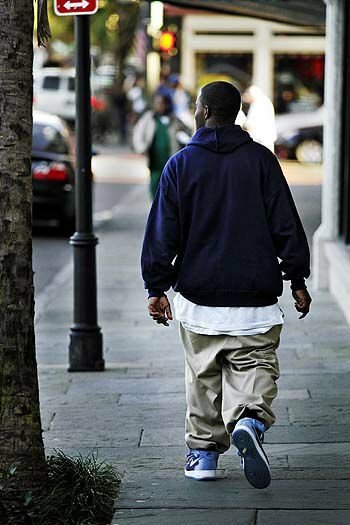 House Bill 4957 covers only males who allow their pants to sag. Females are not included in the bill's wording. Gailliard said he still supports the idea but not in the present atmosphere. Lead sponsor Rep. Joe Jefferson, D-Pineville, said he's not giving up. "The bill is really to provide some degree of dignity and respect from those who are wearing these pants," he said, adding "It transcends all races. It’s not a black or white thing. I see as many guys in both races wearing their pants in a fashion that is unbecoming, and they need to do a better job." Under the bill, the fine would hit $75 for a third offense and six hours of community service. A violation won't jeopardize participation in college financial aid, the bill stipulates. South Carolina lawmakers have tried to pass similar legislation in the past but it went nowhere. Civil libertarians immediately attacked the idea as unconstitutional, saying the government should not be fashion police. Jefferson said the fact that much of the nation is following the gun debate after last week's fatal shootings in a Florida high school shouldn't stop other legislation in its tracks. "There are some people saying because of the gun issue and other concerns it may be inappropriate to bring it up at this time, but when is it going to be appropriate?" he said. "We deal with so many bills at the same time, why not allow this one to at least have a hearing and make people aware something needs to be done about it?" Jefferson said he didn't know who was complaining about the bill. "I’ve gotten some calls. Some people say it’s more identified in the black community. I don’t see it that way," he said. "I see men of both races walking around with it and it shows disrespect. It’s unbecoming of a culture that should present itself in a fashion that respect should be given to everybody." Seanna Adcox contributed to this report from Columbia.